...Kohler & Agriculture Solar-Diesel Hybrid Generators Increases Efficiency, Lowers Cost of Gas and Maintenance. Agriculture Energies provides a full package for powering your irrigation of any size. Critical power applications in irrigation is part of every business; protecting them starts with reliable Kohler and Agriculture Solar hybrid generators, available in diesel, gas and LP configurations. 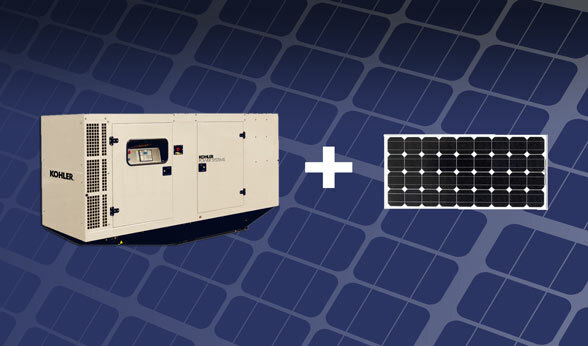 This full line of EPA-compliant solar-diesel models deliver dependable power to a wide range of output requirements. From small-load business to heavy industry, every Kohler and Agriculture Solar hybrid generator is engineered to provide maximum power, performance, flexibility and fuel efficiency. • More than 60 models from 8.5 to 3250 kW, to match specific requirements. • Exceptional motor starting and voltage recovery. • Configurable to a variety of system needs. • Retrofit Agriculture Solar hybrid system to the existing generator. • Reduce your genset maintenance. • Use existing infrastructure adding just power system minimizing costs and installation time. Total Systems Integration: Agriculture Solar's integrated communication systems translate to better performance, easier maintenance and dependability. For every aspect of your critical load requirements, Kohler & Agriculture Solar has engineered the product: EPA-compliant generator sets, a full line of automatic transfer switches, customizable paralleling switchgear, and controls that can manage a multitude of power systems applications, along with wireless monitoring and Web-enabled remote PC. Each has been prototype-tested and proven by real-world rigors. So you get everything you need in one place. At Agriculture Solar, Kohler Hybrid Generators and Agriculture Energies can be your simple solution. Agriculture Energies and Generac Generators is once again highlighting their commitment to continuous improvement with the solar-diesel hybrid industrial configured generators for both single and paralleled emergency and standby solutions. The highly competitive and dependable solar-diesel engines afford these generators greater levels of efficiency, affordability, ease of maintenance and all of the other collateral benefits of standardization.